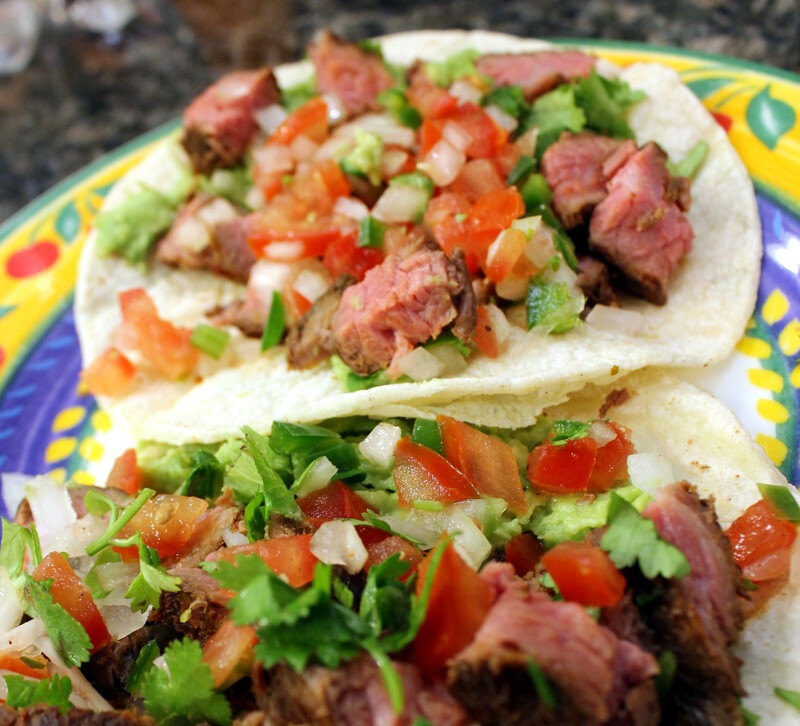 I had a gorgeous hunk of flank steak in our freezer from our quarter cow we bought last year, and carne asada street tacos were calling my name! 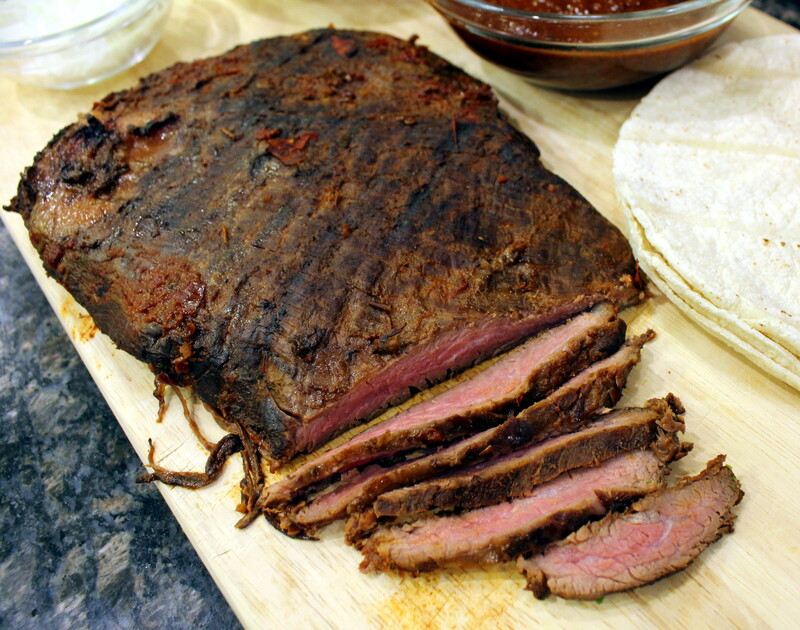 Typically skirt steak is used for these tacos, but I figured the leaner flank steak would work just as well provided it was marinated in a citrusy sauce for a spell. I decided to cook this via the sous-vide method, but grilling the steak would work just as great. Total thumbs up all the way around for the tacos! We had plenty of leftovers for another dinner even with my daughter eating three of them in one sitting. I made some fresh pico de gallo to serve these with along with the avocado, but you can use any condiments of choice for these tasty tacos. 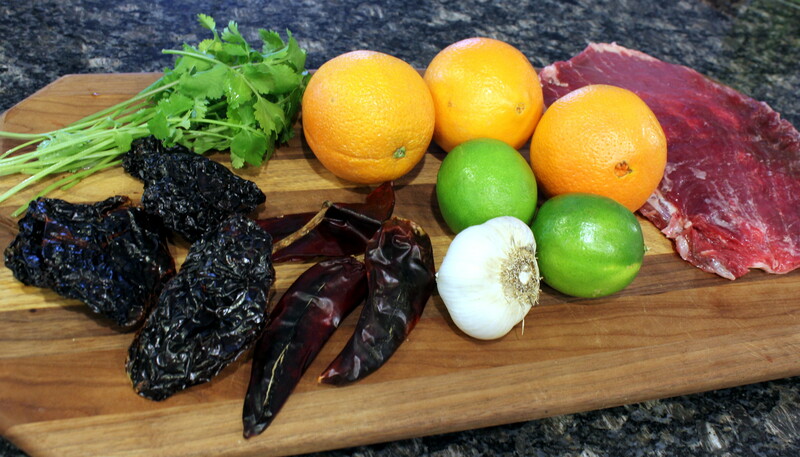 Place dried ancho and guajillo chilies in a glass bowl and cover with boiling water. Let steep for 20 minutes until soft and pliable. 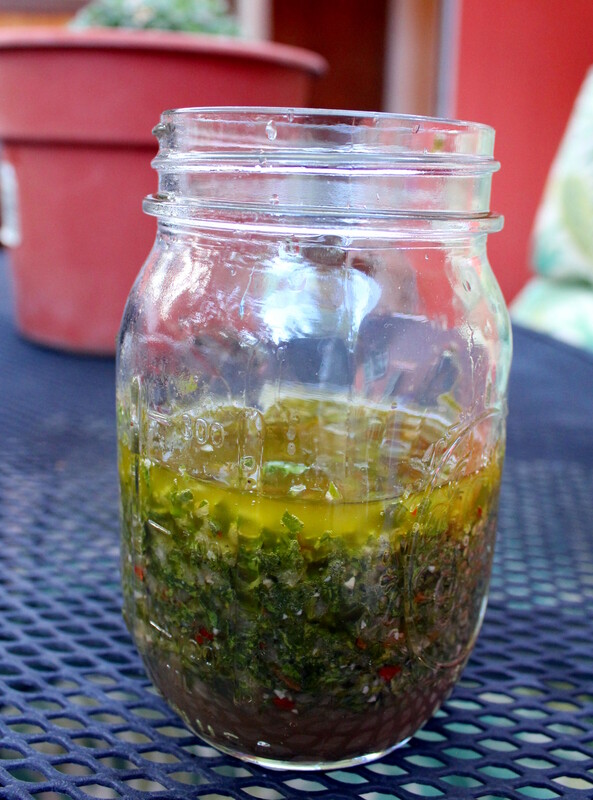 Drain water, then transfer chiles to a food processor or blender. 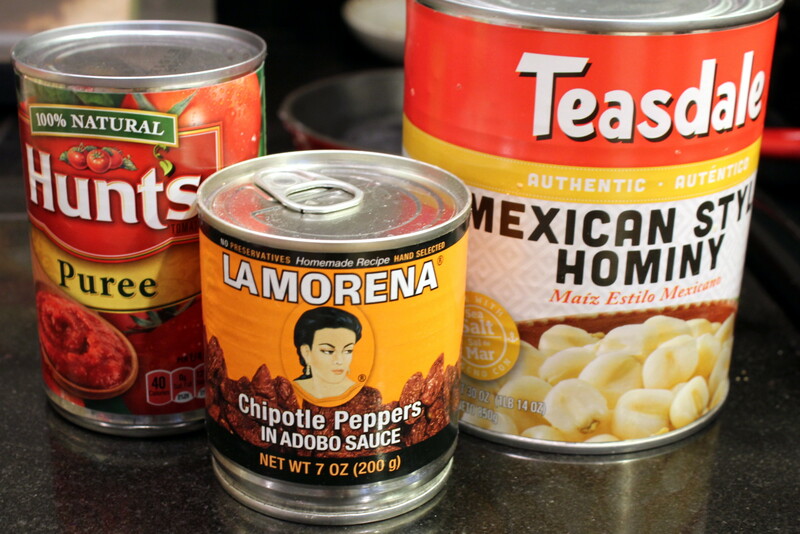 Add the rest of the ingredients except steak and condiments. Blend until a smooth sauce has formed. Transfer half of the sauce to a gallon-sized zip-top bag and refrigerate or freeze the other half in a sealed container for future use. Mix all the ingredients in a small bowl, and let marinate for an hour or so. That’s it! Add steak to the marinade in the bag, squishing around to coat. Vacuum-seal the bag using the water immersion method. Set temperature on the sous vide to 131 F, then place the bag in the pot and cover with plastic wrap to prevent evaporation. Cook for 24 hours. After 24 hours, preheat a cast-iron pan on high. 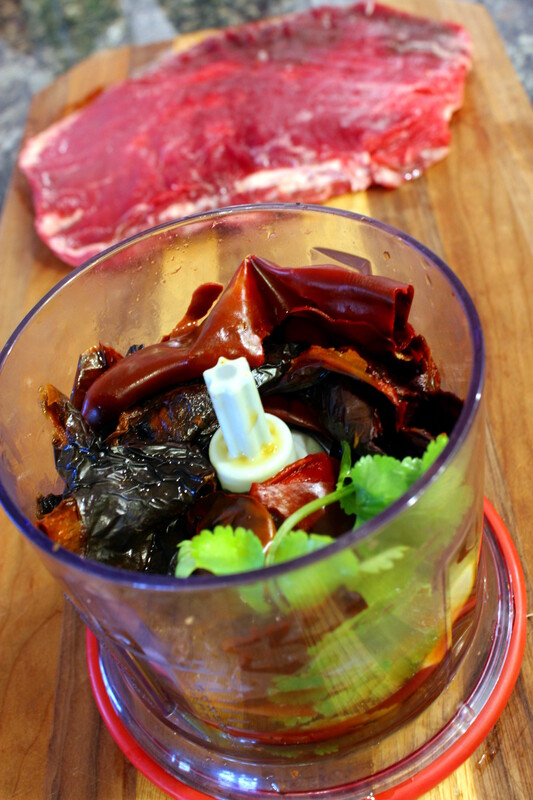 Remove the bag from the sous-vide pot, then remove the steak from the marinade and wipe off excess. Discard marinade. Char the steak in the hot pan for a minute or two on each side until well-browned. Transfer to a cutting board and slice thinly against the grain. Serve immediately with warmed tortillas and garnishes. Add steak to the marinade in the bag, squishing around to coat. Squeeze the air out of the bag, seal, then refrigerate for at least 3 hours or up to overnight. When ready to cook, preheat your grill on one side to the highest temperature. Clean and oil the grilling grate. Remove steak from marinade and wipe off excess. Place directly over the hot side of the grill. If using a gas grill, cover; if using a charcoal grill, leave open. Cook, turning occasionally, until steak is well charred on outside and center registers 110°F on an instant-read thermometer, 5 to 10 minutes total. Transfer to a cutting board and allow to rest for 5 minutes. Slice thinly against the grain. Serve immediately warmed tortillas and garnishes. The snow will just not stop where I live! We are buried, I tell ya’! So of course I made more soup (spicy too!) to ward off the snow demons and hopefully melt them. I made this earlier in the year from a recipe at Cooking on the Ranch, but the hubs said there was too much seasoning in the shrimp meatballs and he couldn’t taste the shrimp. So I made a notation on the recipe to make it again but with noted adjustments. I did, and the meatballs came out so much better this time! We really enjoyed it so I hope you do too! 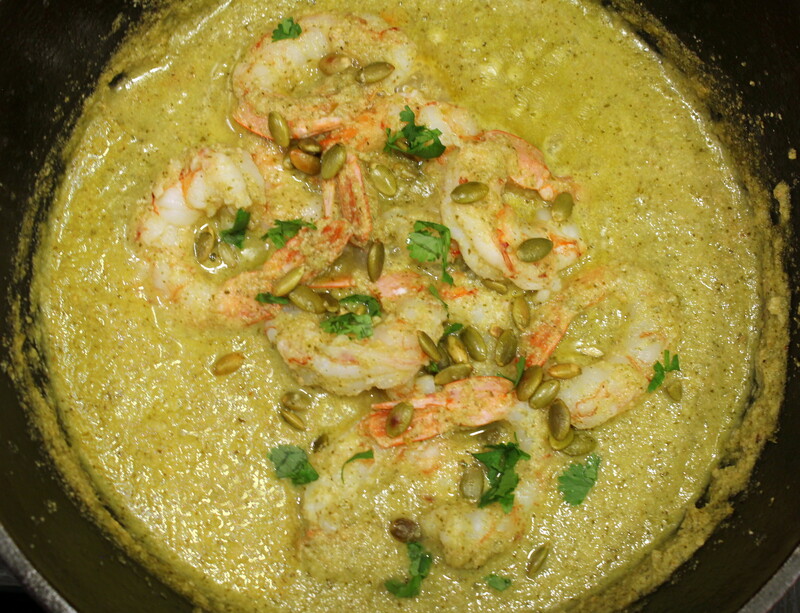 Add the shrimp, onion, tomato paste, spices and herbs, flour, egg yolk and salt to a food processor. Pulse until well combined. Cover and chill in refrigerator for a half hour. Meanwhile, start making the soup. 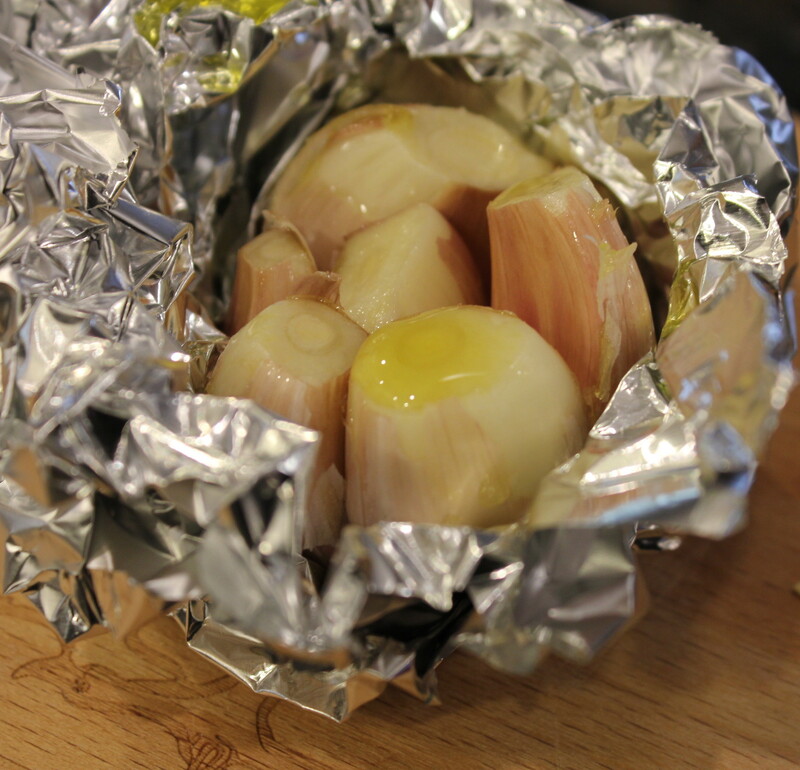 Heat the olive oil in a soup pot or Dutch oven and saute the onion until translucent and soft, about 5 to 7 minutes. Add the garlic and cook for a minute more. Add the tomatoes and chiles and simmer over low heat for about 10 minutes. Add the stock, bay leaves, and pepper and salt, to taste. 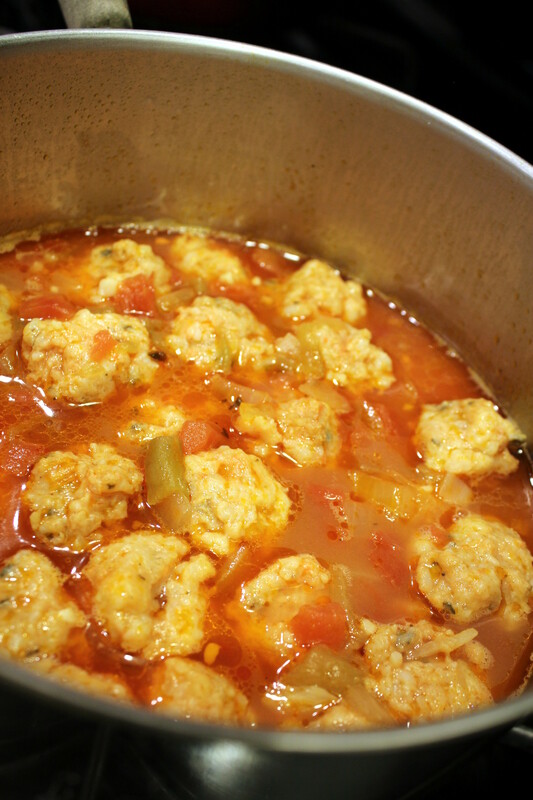 Bring up to a simmer again, then simmer on low heat while you make the meatballs. Get a bowl of water ready and add parchment paper to a large cookie sheet. 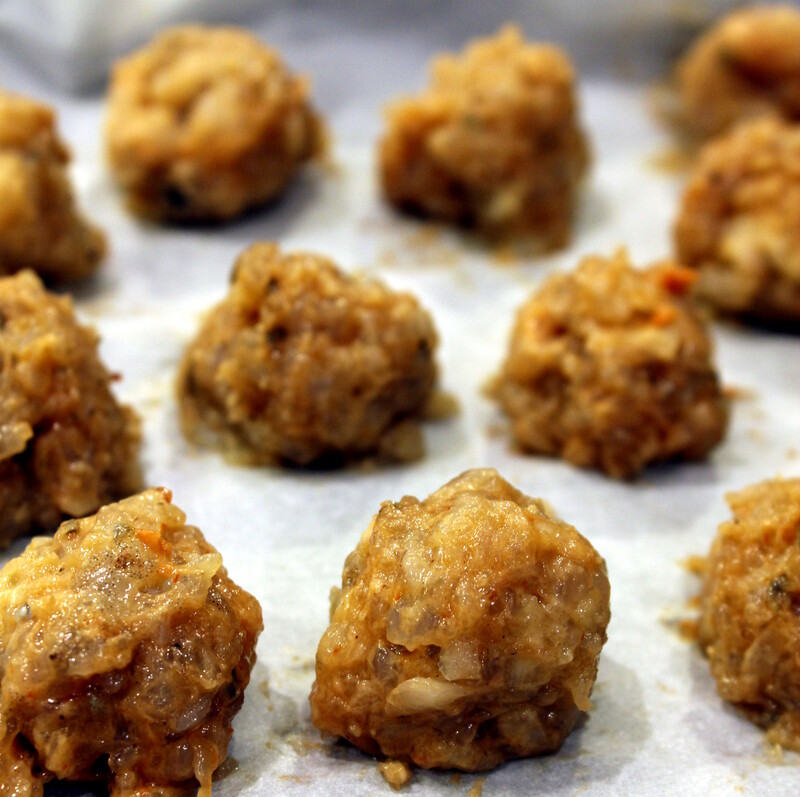 Dip your hands in the bowl of water, and using a spoon, scoop out a large teaspoon of the shrimp mixture, and roll into a ball and place on the cookie sheet. 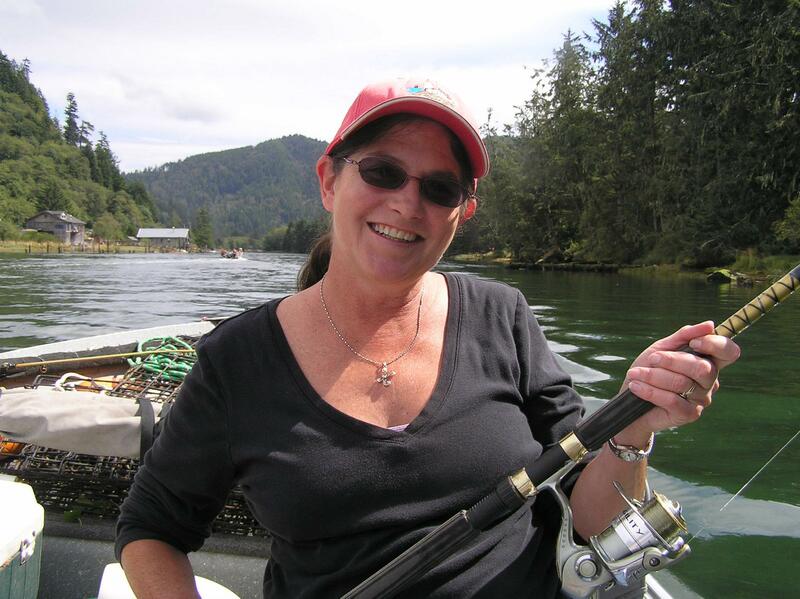 Dip hands in water as needed, it prevents the shrimp mixture from sticking to your hands. Repeat until shrimp is gone. 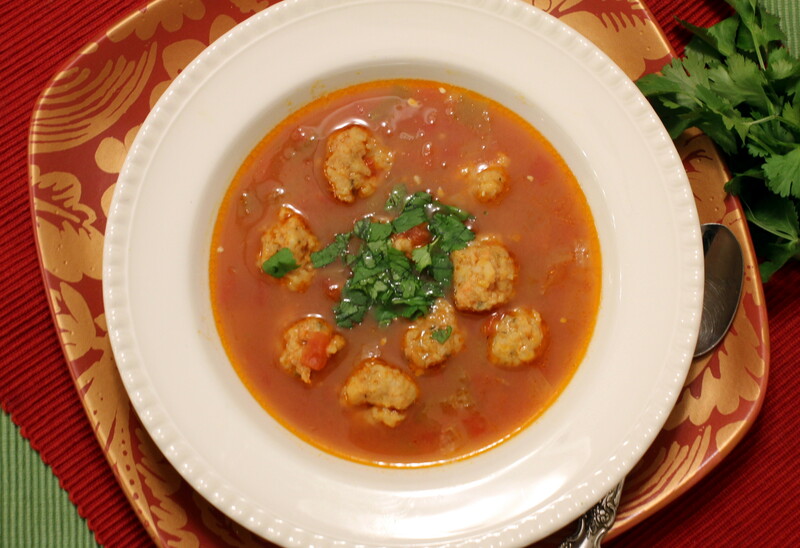 Drop the meatballs carefully into the soup, then bring to a simmer again heat the meatballs until cooked through, about 5 to 7 minutes. 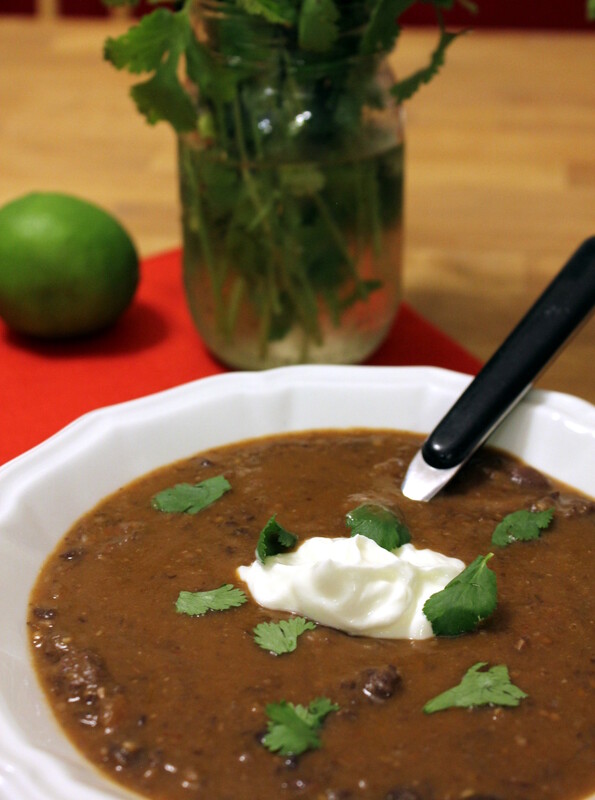 Remove bay leaves, and serve soup in bowls garnished with chopped cilantro. Happy New Year my friends! 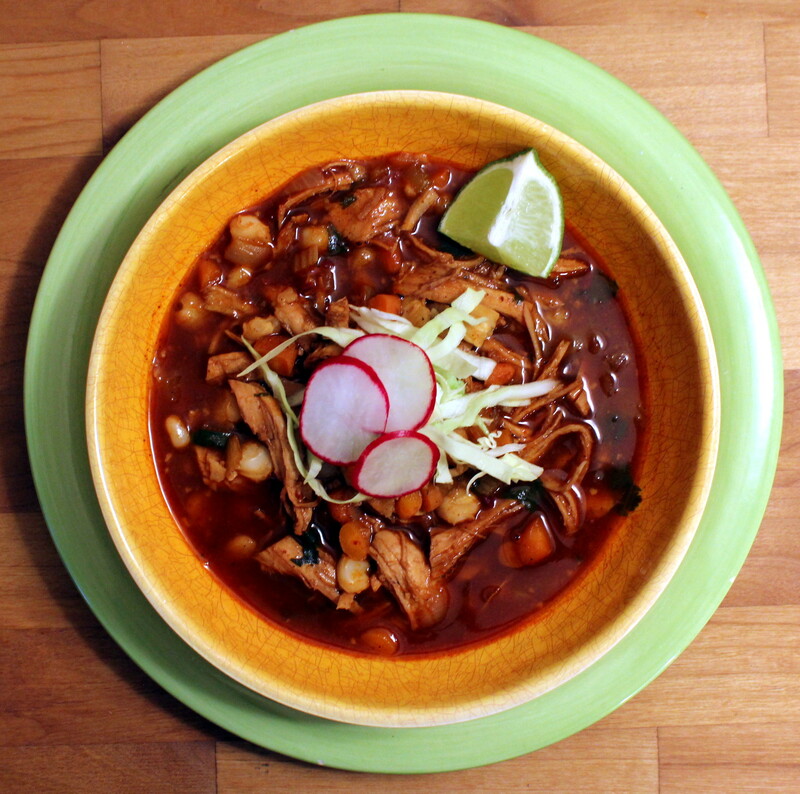 I thought about freshening up my good ol’ black-eye pea recipe for today, but instead decided to give you a quick and easy posole recipe that can make good use of any leftover meat you may have hanging around from the holidays. This includes pork, chicken, turkey, or beef! 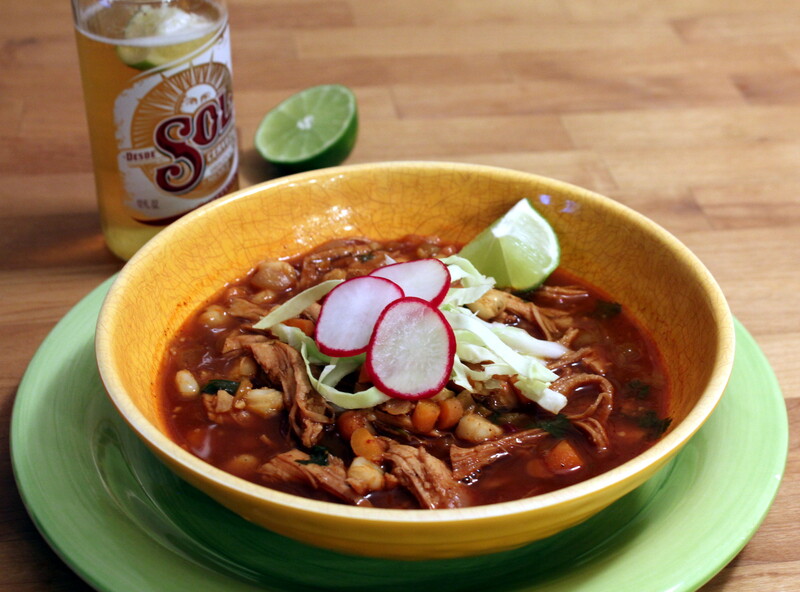 This posole is huge on flavor and does not even skimp in the filling factor. Plus it’s very versatile, too! Thumbs up all the way around! Hint: Make a double or triple batch to store for future use! Finely dice the onion, then add it to a soup pot or Dutch oven along with the oil. Sauté the onion in the oil over medium heat for about 5 minutes, or until tender and transparent. 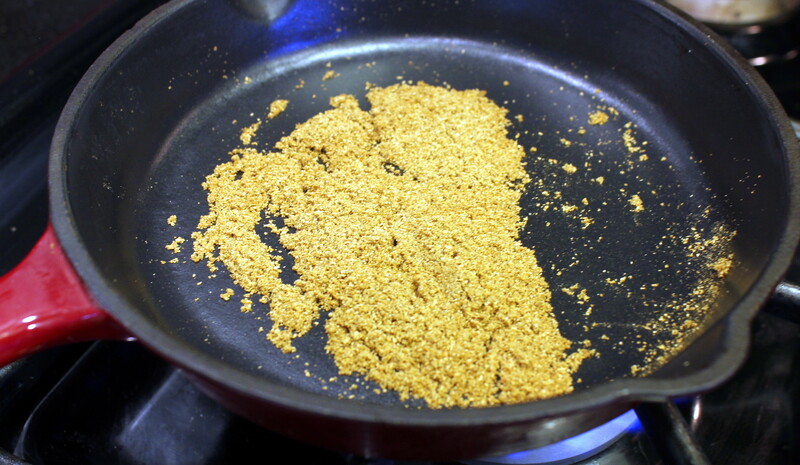 Add the flour and a tablespoon of the seasoning mix and continue to sauté for two minutes more. 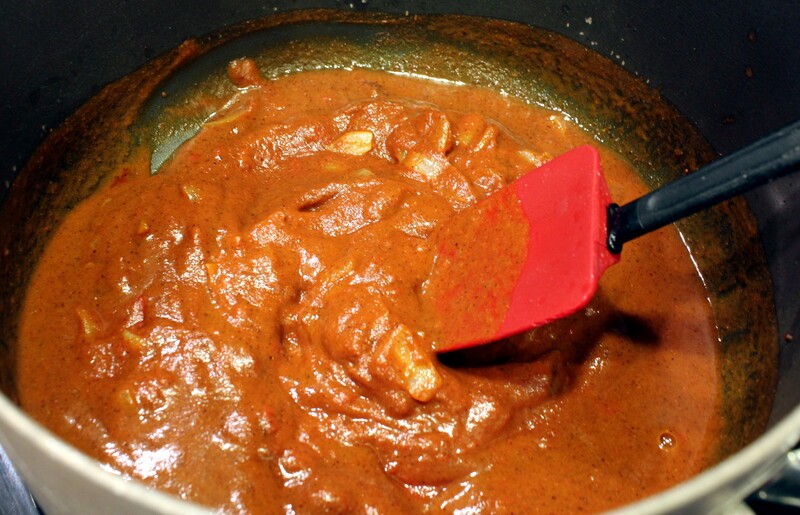 Add 1 cup water, tomato paste, and the rest of the seasoning mix to the pot. 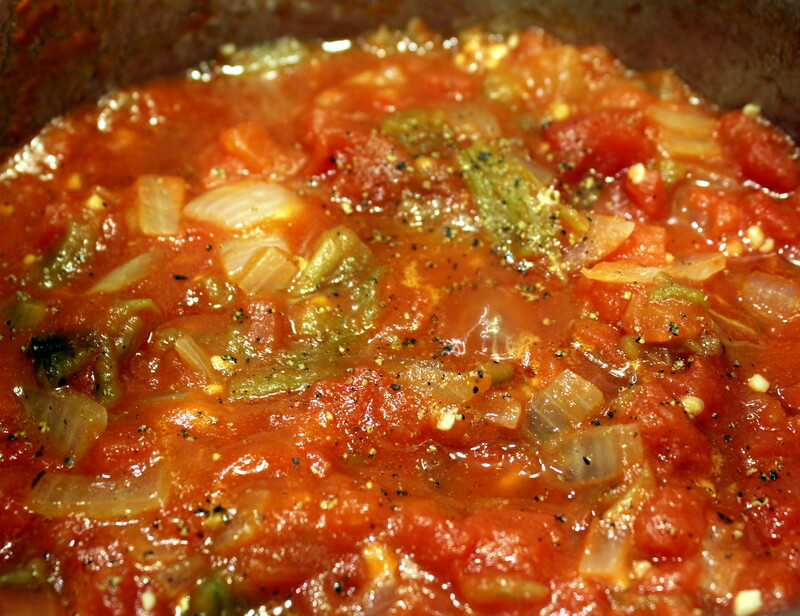 Whisk the ingredients together until the tomato paste is dissolved. Allow the mixture to come to a simmer, at which point it will thicken. Finally, add the stock, shredded meat, diced chiles, and hominy. Stir to combine and then heat through for about 10 minutes. Cut the lime into wedges and roughly chop the cilantro. 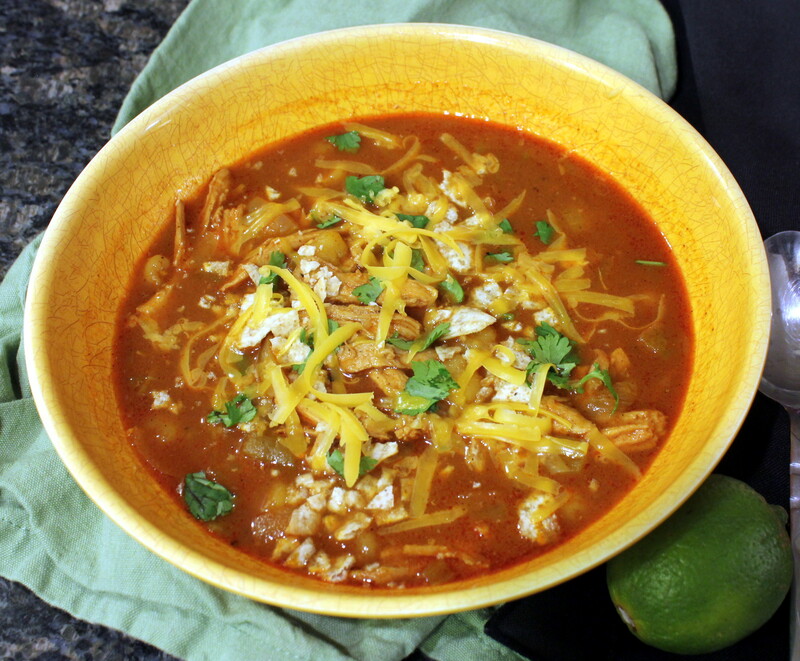 Top each bowl with chopped cilantro, crumbled tortilla chips and cheese and a wedge of lime to squeeze over top. 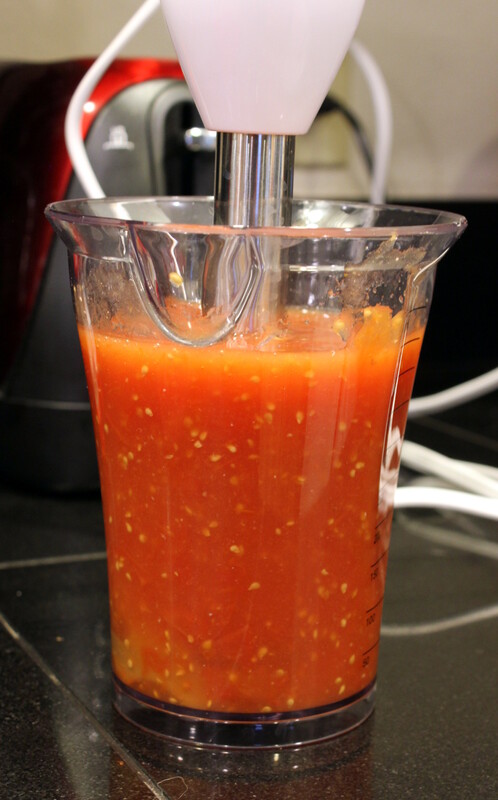 This is a very versatile, slightly spicy sauce that can be used as a topping on any grilled (or otherwise) protein, like steak, chicken, or fish. 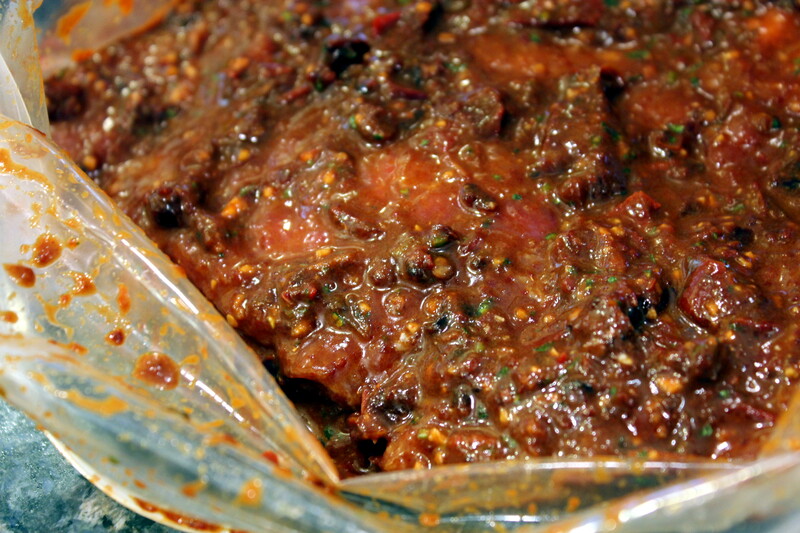 It can also be used as an overnight marinade, which I also used it for later in the week for a tough cut of meat. It’s a winning combination of flavors. This will keep two to three weeks in the fridge if you keep adding a little oil to keep it covered. When you want to use it for a recipe, just take it out of the fridge at least an hour beforehand to let the oil warm and loosen up and then give it a good shake or stir. This is also best made at least a day or two ahead to let the flavors meld. I used some cilantro from my garden along with the parsley but if you are in the “cilantro-hating” camp you can also sub some spicy arugula or other green. It’s all good! 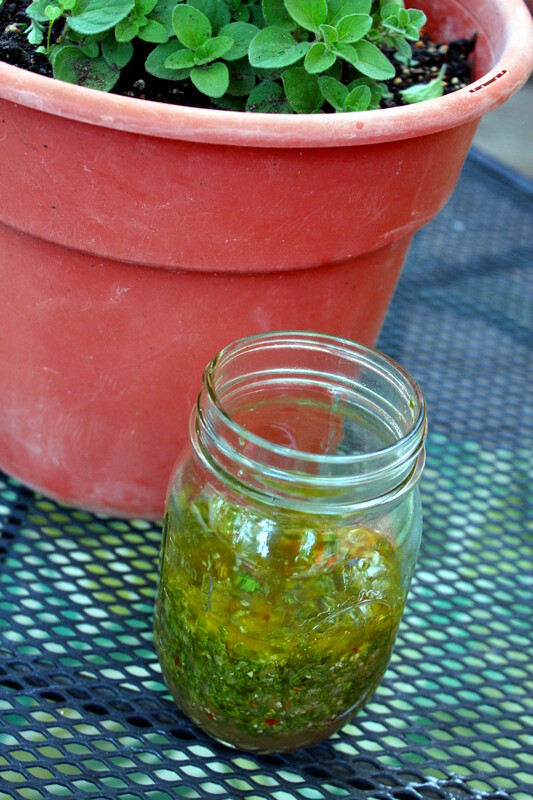 I also used my spicy oregano plant (as opposed to just regular oregano) to give it an added kick. And a huge shout-out to The FrugalHausfrau again for inspiring me to adapt her recipe! Click on her link to see the original. 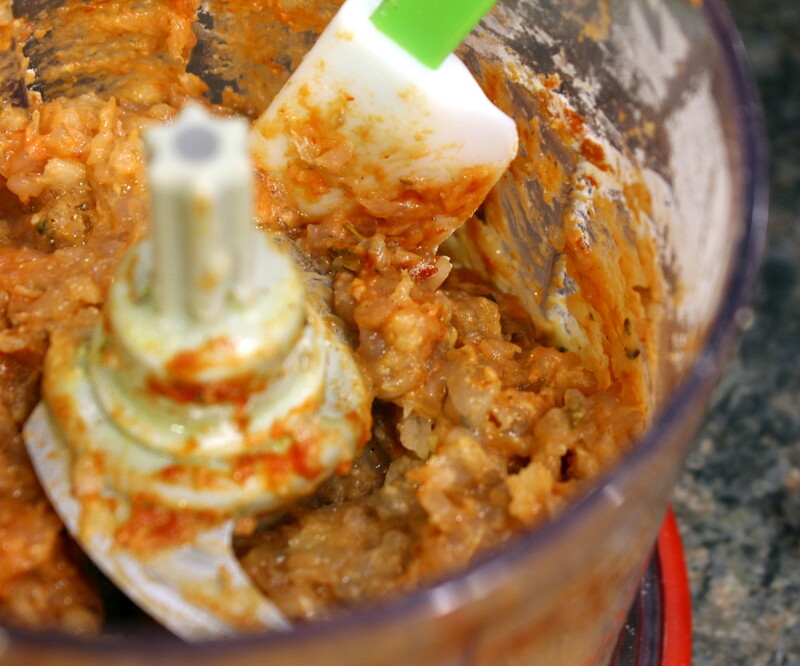 Combine all ingredients in a food processor or blender until finely minced, scraping down the sides as needed. Taste for additional seasonings, and add as needed. Allow to stand for 30 minutes, then add more oil after rest time if it’s not covered with at least 1/4 inch of oil. Cover and chill (I put mine in a Bell canning jar) for at least 3 hours or overnight. Overnight is better. Bring to room temperature at least an hour before serving. 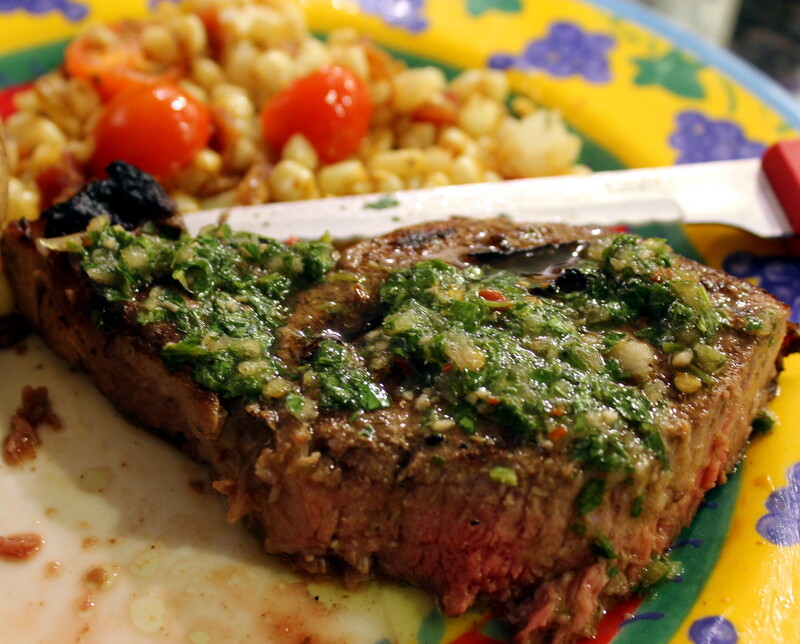 Serve over grilled steak, chicken, or fish, or use it as a marinade. Enjoy! 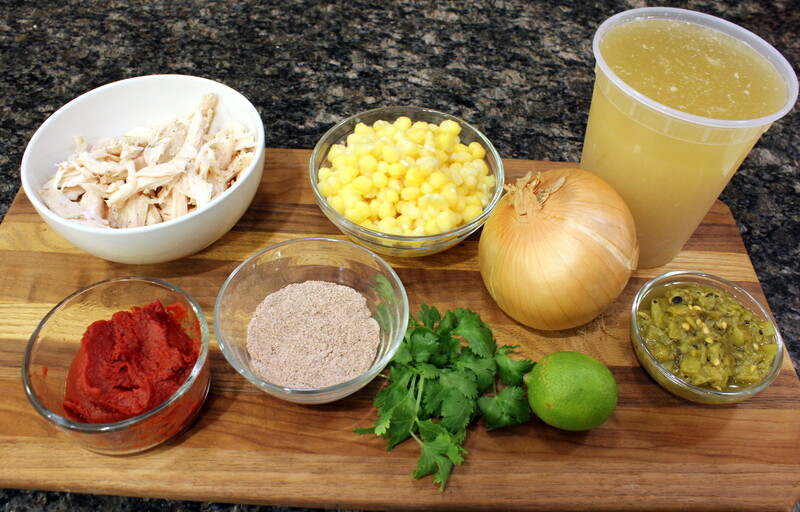 We have a local restaurant that serves an amazing Mexican chicken dish called Marcos Pollo. 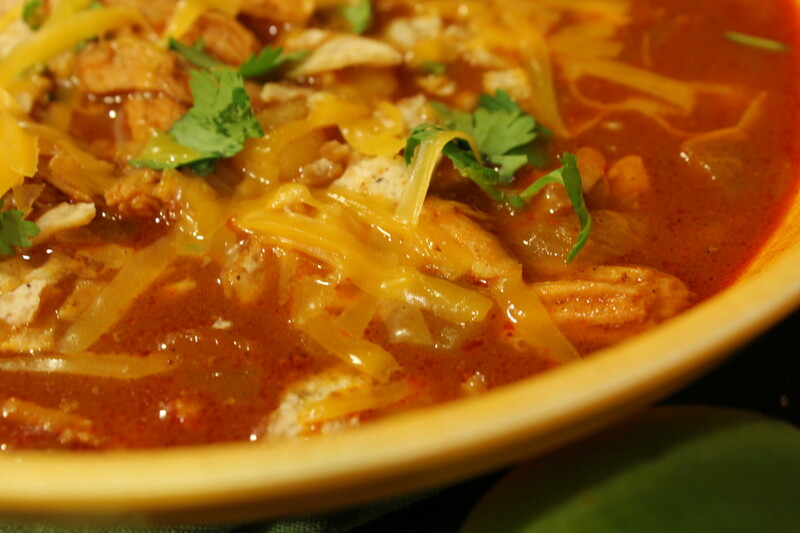 It’s a creamy/spicy dish filled with chicken and mushrooms and served with rice and beans and tortillas. I decided to recreate this as best I could, and my husband thought it was spot on! Aside from telling me it was delicious, he wants me to add more mushrooms, increase the sauce, and make the chicken cubes smaller next time. Ever the critic, isn’t he? 😀 But I did agree with him except the chicken chunk size. I like a nice mouthful of chicken with each bite! Cut the chicken into bite-sized cubes, then mix with 1 tablespoon of the olive oil, the paprikas and minced chipotle in adobo in a non-reactive bowl or zip-top baggie. Refrigerate until ready to use. Bring the chicken stock to a boil in a small saucepan, then lightly boil until the stock has been reduced to about 1/4 cup. Remove from heat and set aside. This took about 20 minutes. Meanwhile, slice the onions and mushrooms. After chicken stock has reduced, add the chicken and onions to a large skillet over medium heat. Cook for 5 to 7 minutes. Remove to a clean bowl and set aside. Add the other tablespoon of oil to the skillet then cook the mushrooms until golden brown, about another 5 to 7 minutes. Deglaze the pan with the reduced stock. Add the chicken and onions back to the skillet, then stir in the cream and sour cream until combined. Next add the corn starch/water slurry, then simmer and stir until the sauce has thickened. Remove from heat and serve over cooked rice, black beans in warmed corn tortillas. Garnish with cilantro, if desired. I had a hankering for Tex-Mex last weekend, and when I get a hankering for something there is no stopping me! Of course I wanted to use some of my roasted Hatch chiles and Mexican chorizo sausage from the freezer, and lots of ooey-gooey cheese. The supermarket has started carrying “artisan-style” tortillas in a variety of flavors, so I picked up some whole wheat/corn blend in a “New Size!” I wonder what the old size was as I had never even seen them before. The new size turned out to be 8 inches, which made it tricky fitting them into my existing casserole dishes, and I wasn’t planning on making a huge batch for a 9 x 13 dish. Placing them length-wise in my 2-quart casserole did the trick! I ended up with 5 rather large enchiladas, which was almost a perfect amount for the three of us. One thing to note: These did not seem to reheat well the next day (too dry), so plan on adjusting the amounts or eating the entire dish! If I weren’t trying to cut my calorie intake recently I certainly could have eaten more than I did. I got thumbs up all the way around from the fam for this, and my hankering was well-satisfied. The flavors were just fantastic and the perfect blend of spices, chiles, and cheese. 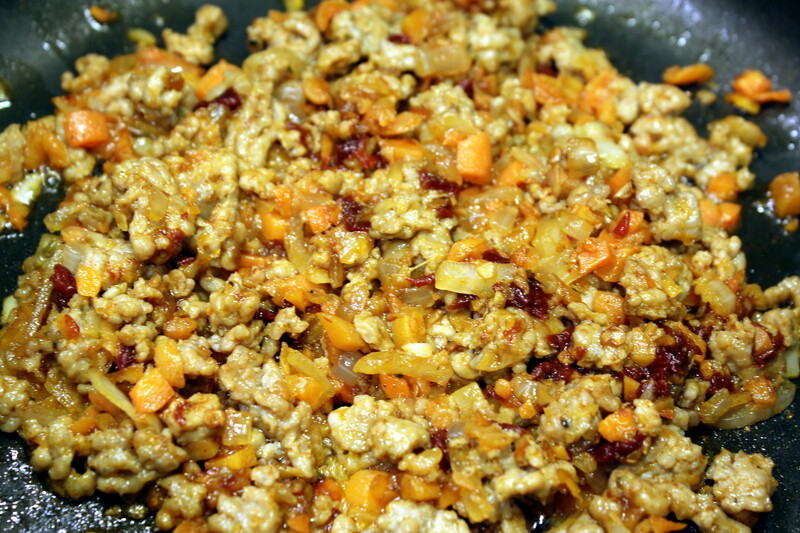 In a skillet over medium heat, add the ground beef and Mexican chorizo and brown. 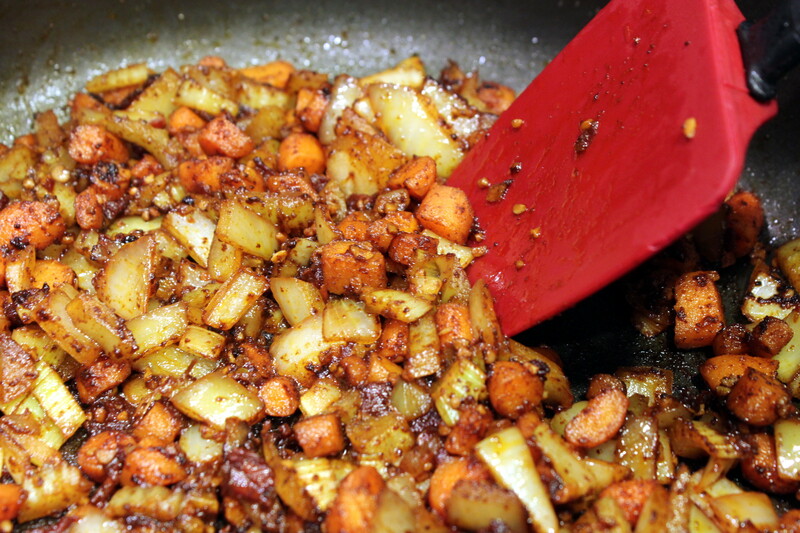 Add the mushrooms, onions and chile peppers into the mixture. Add the smoked paprika, then salt and black pepper to taste. Cook for about 5 more minutes, then add 1/2 cup of broth. Simmer for a minute or two more until the broth reduces, but don’t let the mixture dry out. Turn off heat and set aside. In a cast iron or other skillet, heat up a small amount of oil over medium-high heat. One at a time, heat each side of a tortilla until pliable and just starting to brown. Don’t overcook or the tortilla will be difficult to roll. Place on paper towels to drain. Repeat with remaining tortillas, adding a small amount of oil as necessary. Spoon the meat mixture into a tortilla, then roll up, placing seam-side-down in the in a lightly oil-sprayed casserole dish. Repeat until mixture is gone. In the same skillet the meat mixture was in, melt the butter over medium heat. You don’t need to wipe out the pan first. Sprinkle the flour over the melted butter, whisking continuously until the mixture is light golden brown. Add the remaining broth and whisk until starting to thicken. Add the rest of the chopped green chiles, stirring to incorporate. 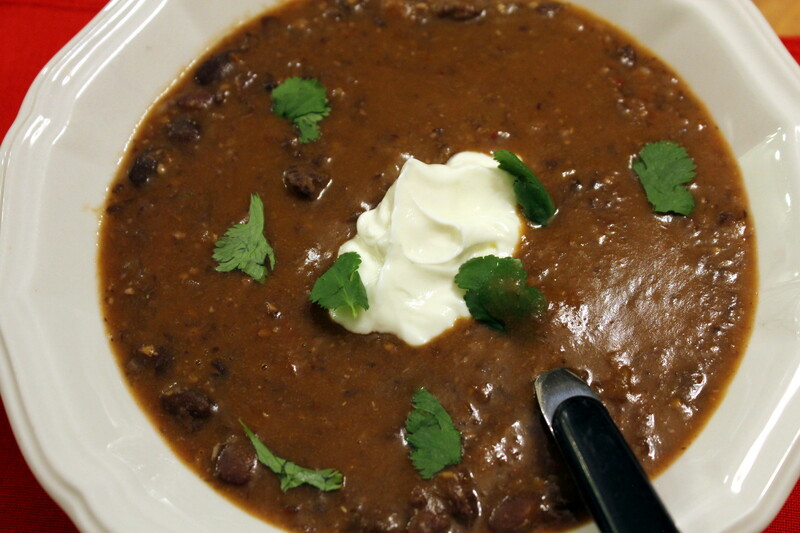 Reduce the heat and mix in the sour cream, then add the cheese to the sauce. Stir until combined and melted. Pour the sauce evenly over the rolled tortillas. Bake the enchiladas at 350 for 20 to 25 minutes, until bubbling. Remove and let sit for 5 to 10 minutes. Serve enchiladas garnished with avocado and cilantro. I have this awesome foodie friend named Adam. Adam J. Holland is his name and he cooks some crazy good food and shares it with the world on his website The Unorthodox Epicure. Not only is he talented food-wise, he is also a talented and witty writer. Do pop over to his blog at some point and check him out. Now, on to this fabulous soup that I “stole” from Adam. 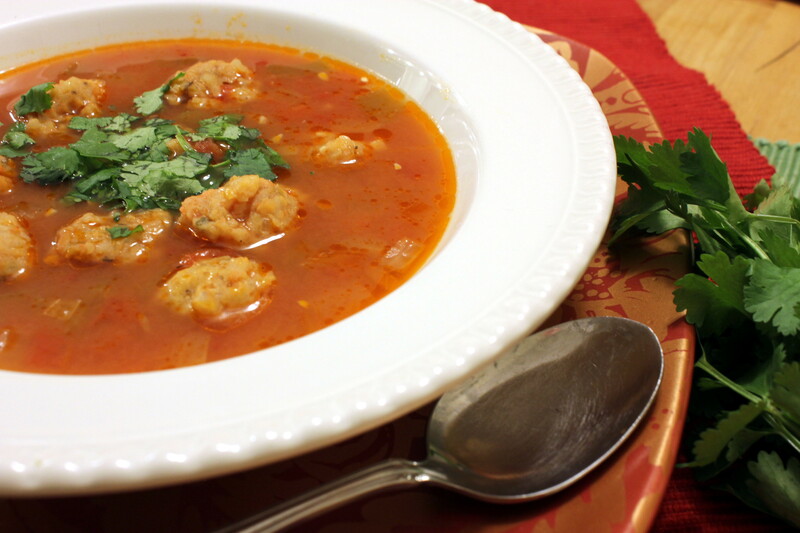 His version of this recipe is not a soup, but since I am a soup fanatic I just had to transform it into one. I added a few other tweaks, but the base recipe is fabulous on its own. 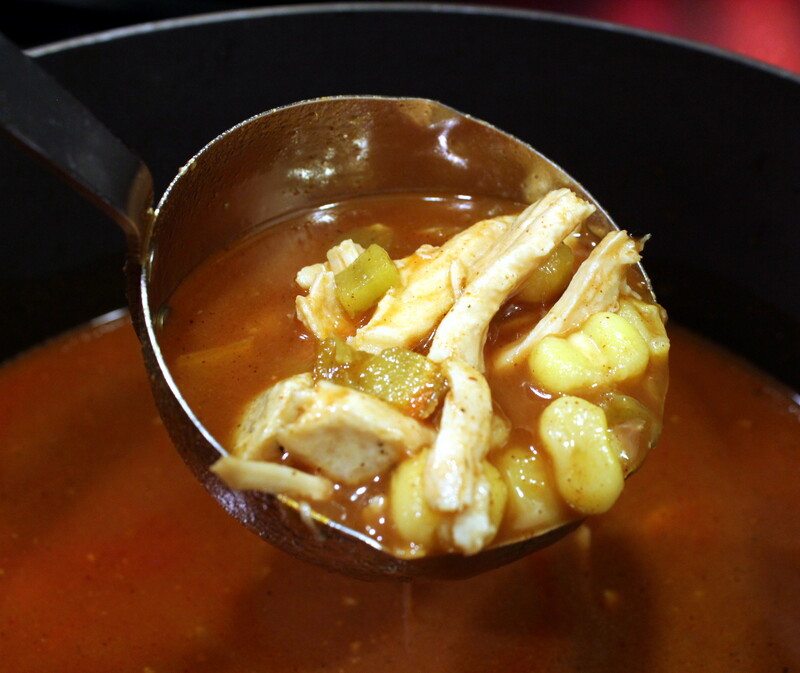 My family LOVED this soup, and the hubs declared it a soup that I MUST make again! How’s that for a complement? He tends to be wary whenever I spring something “different” on him. I am very happy to have a new soup to add into the rotation! 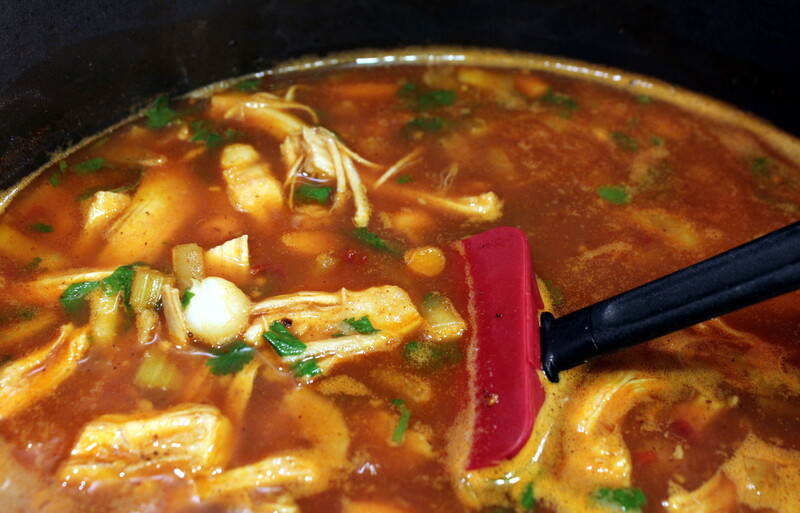 After I took my photos my husband decided to crush up some tortilla chips and add it to the soup. It was a GREAT idea! It complemented the soup very nicely. In a Dutch oven or soup pot, heat the oil over medium heat. Add the onion and cook until starting to soften, about 5 minutes. Add the garlic, jalapeño, tomatoes, tomato paste, chile powder, and ground black pepper and salt. Stir and cook for about 7 more minutes. Add the ground beef to the pot, breaking it up with your spatula. Cook until the beef is no longer pink. Add the beef stock, cabbage, cilantro, and lime juice. Bring up to a simmer and cook for about 10 minutes more. Serve in bowls and garnish with tortilla chips (optional).